Update your light fixtures! We often overlook them on our hurry to get inside with an armful of groceries. Perhaps they’re the fixtures that came with the house. You may not notice them now – but update them, and you certainly will. Choose fixtures that are consistent with the style and decor of your home to greatly enhance its outdoor beauty. 2. Let There be (Landscaping) Light! Landscape lighting (including path lights, accent and flood lights) increases security around your home. It boosts curb appeal, highlighting elements on your property that you wish to feature, such as walkways or fountains. The illumination creates a soft, welcoming atmosphere. 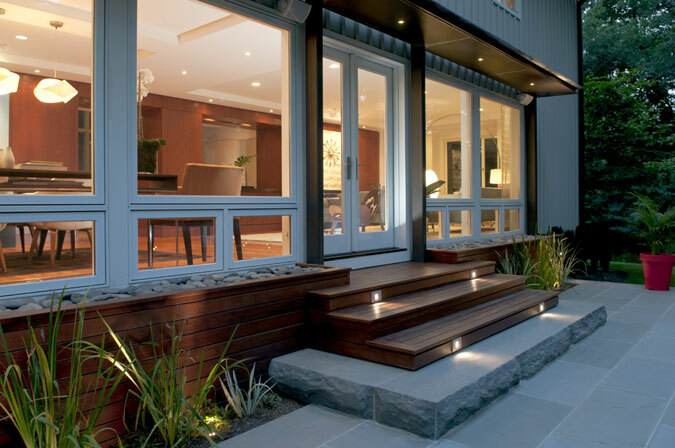 Landscaping light allows you to enjoy your outdoor space both day and night. Consider stair lighting to increase your home’s aesthetic appeal and improve safety. Down lighting highlights staircases and helps avoid accidents; an appealing and functional addition to any home. Prevent outdoor light fixtures from rusting and corroding. Choose quality materials when selecting them. Do you live near the ocean? Avoid aluminum, which is more susceptible to corrosion in the harsh salty air. Opt for weather-proof brass or steel. Fixtures should also be properly maintained, and debris and buildup cleaned regularly. Say goodbye to cobwebs and bird droppings with a quick rinse every month or so. This allows for better light transmission and a nicer overall aesthetic. Quality outdoor lighting adds elegance and value to your home, revealing its full potential with a few simple measures.